Opera Atelier mounted the North American premiere of Armide (1686) by Jean-Baptiste Lully in 2005 to celebrate its 20th season. Now OA has revived the production of this work, often considered the pinnacle of 17th-century French opera, in an enhanced version even more opulent than it was before. It is a visual and musical feast that OA has been asked to take to the Opéra Royal de Versailles May 11-13, 2012 and to Glimmerglass Opera July 21-August 23, 2012. Addition: As for the 2015 revival, if Armide is the pinnacle of 17th-century French opera, this production, especially its current incarnation, is one of OA’s highest pinnacles of achievement. The story, based on an episode of Torquato Tasso’s epic Gerusalemme liberata (1581), is set during the First Crusade and, as one might expect, depicts the Crusades as a battle between Good as embodied by the Christian knights and Evil as embodied by the Muslims. What is quite surprising is that Lully’s librettist Philippe Quinault takes a more complex view of his characters than is present in his source. As the opera opens, the Muslim sorceress Armide (Peggy Kriha Dye) and her uncle Hidraot (Stephen Hegedus), are celebrating Armide’s victory over the Christians. Soon, however, they are dismayed that a single Christian knight, Renaud (Colin Ainsworth), has rescued all the men Armide had captured. She vows to wreak revenge upon him by luring him to the enchanted garden of her castle where he will forget all sense of duty and glory. Renaud is drawn into her trap but at the crucial moment when she means to kill him, Armide finds to her dismay that she cannot. Indeed, she has fallen in love with her enemy. Besides this, Renaud falls deeply in love with Armide but, as Quinault makes clear, not because of her spells to which he is impervious. Thus, remarkable for the period, Quinault, unlike Tasso, emphasizes that Renaud’s love for Armide is real, and, again unlike Tasso, he excludes any hint of Armide’s later conversion to Christianity. The opera concludes instead with her despair at Renaud’s departure and the destruction of her castle of pleasure, the outward symbol of her happiness. Quinault thus raises Armide and Renaud to the level of doomed lovers of classical literature like Dido and Aeneas and his keen exploration of the internal turmoil caused by love should remind us that Quinault (1635-88) was a contemporary of Jean Racine (1639-99). All the singers have fully mastered the declamatory style that dominates the work. Both principals, mezzo soprano Peggy Kriha Dye and tenor Colin Ainsworth give outstanding performances. The voices of both have noticeably matured. Ainsworth has always been blessed with an unusually high, pure tenor. Now it thrills with remarkable power and expressivity. Dye’s voice has always struck me like a diamond glittering against a dark velvet. Now it, too, has gained in strength. With Ainsworth and Dye, the scenes between Renaud and Armide are not only musically exquisite but as emotionally powerful an any in all opera. In the supporting cast bright-voiced sopranos Carla Huhtanen and Meghan Lindsay are charming as Armide’s two confidantes and later as magic spirits. Bass-baritone Olivier Laquerre is well-paired with tenor Aaron Ferguson as comic Crusaders searching for Renaud. Stephen Hegedus displays his hard, obsidian-like bass to great effect as Hidraot. Baritone Daniel Belcher makes an impressive La Haine, implacable and vocally emphatic. His counterpart is the beautifully sensitive, winged L’Amour of dancer Tyler Gledhill, who admirably blended athleticism with agility and refinement to make L’Amour as compassionate as La Haine is fearsome. Director Marshall Pynkoski has softened the former rigidity of the stylized gestural language of the period to allow for a greater sense of emotional impulse. His management of the battle between L’Amour and La Haine for the soul of Armide was a perfect example of how an allegorical representation of an internal struggle can be absolutely riveting. 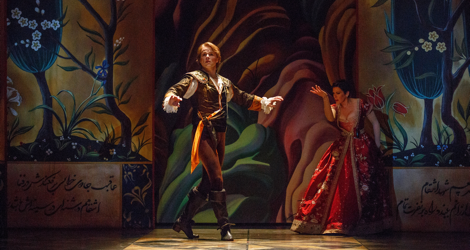 Unlike previous productions, Pynkoski does depict the collapse of Armide’s castle of pleasure and does so with typical theatrical flair, leaving Armide alone and in distress enfolded in the arms of L’Amour. Armide is a perfect vehicle for OA since it tells its story as much through dance as through song. Music frequently passes back and forth between the singers and the dancers who often share the stage in beautifully integrated passages choreographed for the full corps of sixteen by Jeannette Lajeunesse Zingg. Set designer Gerard Gauci and costume designer Dora Rust-D’Eye have turned for inspiration from period European sources to the jewel-like colours and precise lines of Persian miniatures of the 16th century. The front scrim even features a massive tughra of the opera’s title, composer and librettist transcribed into Persian while Persian calligraphy decorates numerous flown panels making them look like pages from illuminated manuscripts. Conductor David Fallis drew playing of breath-taking beauty and lushness the 30-member Tafelmusik Baroque Orchestra, which included two harpsichords, two lutes and percussion. Opera Atelier continues to go from strength to strength. Torontonians, and indeed all Canadians, should be proud that this local company, which has grown through selfless dedication to a vision from its humble beginnings in 1985 to international stature, should yet again represent Canada on the world stage. ☛ In the 2015 revival Daniel Belcher sang La Haine, Stephen Hegedus sang Hidraot and Tyler Gledhill danced L’Amour. Except for changes in the corps of the Atelier Ballet, the cast and creative team were the same. Photos: (from top) Colin Ainsworth as Renaud and Peggy Kriha Dye as Armide; Peggy Kriha Dye and Colin Ainsworth; the company of Armide. ©2012 Bruce Zinger.